I have posted several burgers in my day on this blog, but this one is definitely one of my favorites–not quite as good as the Mango Gorgonzola Burgers (oh my…I crave those every day!! ), but still amazing! I love turkey burgers and I love Greek flavors of lemon, dill, feta, etc. 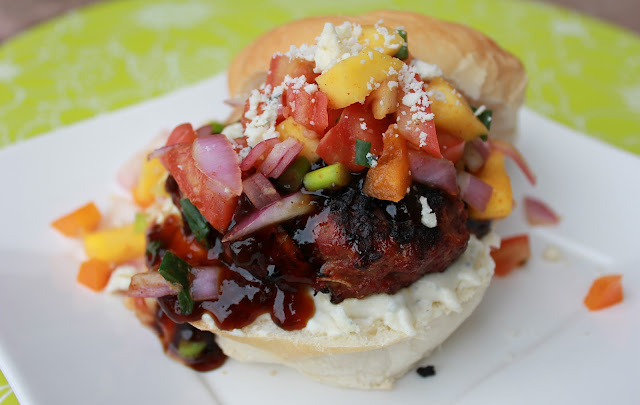 Follow the links below for five of my other favorite summer burgers. Happy grilling! Mix together the burger ingredients until well combined. Form the meat into 6 large patties. Heat a grill to medium-high heat. Grill the burgers on the hot grill until cooked on both sides and no longer pink in the center (about 15-20 minutes on medium heat). Prepare the sauce by mixing the mayo, sour cream, dill weed, garlic cloves, sliced green onions, lemon zest, lemon juice, feta and salt and pepper. Peel a cucumber and dice into really small pieces or shred with a cheese grater. Drain the cucumber excess juices by dabbing with a paper towel. Add the cucumber to the sauce and keep in the fridge until ready to serve. Prepare the burger toppings by slicing the tomatoes, cutting the lettuce leaves and slice the red onions. Make the burgers by spreading a generous amount of sauce on each side of the bun. Add the hot, grilled burger on top, the sliced tomatoes and sliced onions. Oh My goodness!! I was actually on Pinterest looking for a recipe for that sauce. I want to make a greek pizza with that sauce or gyros?? thanks! !